Learn How to Cob & Build Community April 8th & 9th! 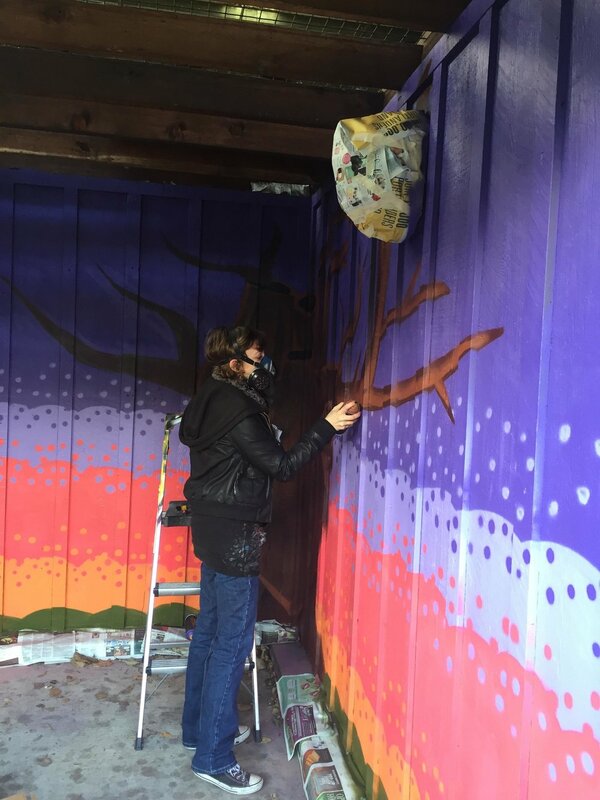 You’ve probably seen the intriguing, organic, red bay at the main entrance of the ReBuilding Center that we call the "Community Trees.” You may have asked yourself how these walls and trees were built? The answer is cob, a traditional building technique using earth mixed with water, straw, and sand. 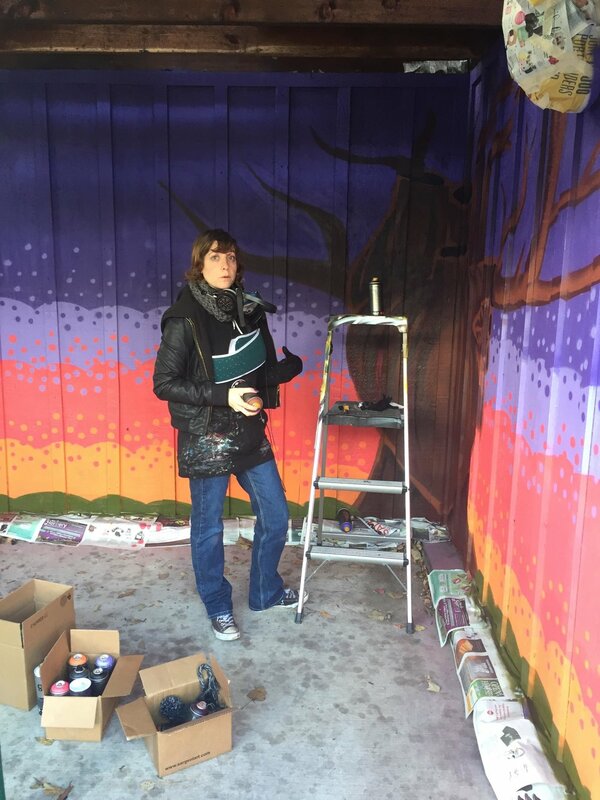 The Community Trees are in desperate need of repair and we need your help to fix them! Learn valuable skills on how to mix, build, repair, and plaster with cob while building community! The ReBuilding Center is sponsoring a two-day workshop to learn about making and using cob to repair the Community Trees. All are welcome! This cob workshop is intended to be accessible for all from children to elders. This is a family-friendly event. Instructors will discuss the a history of the practice and its resilience to earthquakes. Seed was born in Duwamish Coast Salish territory, Seattle, and grew up in Multnomah Chinook territory, Portland. He has traveled around Turtle Island trading work for skills like cob building, gardening, and ecological restoration, with a focus of supporting indigenous sovereignty projects—a core foundation of ecology in every region. He teaches and works with cob as a material for building sound structures, community, and metaphors for his own and our collective volition. Learning and growing through leading workshops past, including the Village Building Convergence, Seed hopes to facilitate a conversation of resilience skills, applied practice, and collective Spirit. Aho! Sharky is a free spirit, born and raised playing in the mud of Kalapuya territory aka Eugene, OR. For the past 5 years, Sharky has traveled across Turtle Island studying off-grid living, natural building, farming, and passive solar construction. After building with different styles including earthships, earthbag construction, and cob, Sharky prefers cobbing because it is free-form, soul-soothing, accessible and fun for everyone. Sharky hopes to empower others to create autonomous buildings and community that, with a little TLC, will last a millennia. This summer Jami and Kourosh Poumad completed a 4,300-square-foot home restoration using as many recycled materials as they could. They wrote and complimented the staff of the ReBuilding Center for helping them select the following, all of which were used in the remodel. Is this the first time you have used recycled items in your home? This is not the first time. 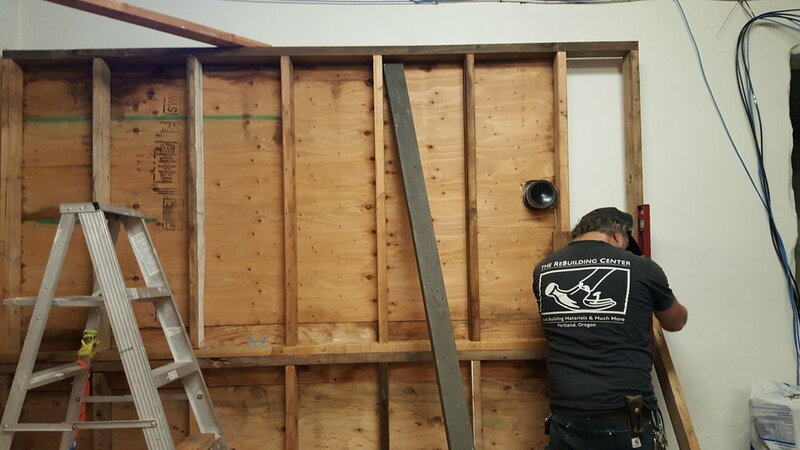 Whenever we have a repair or change at home the ReBuilding Center/recycled materials are our first choice. For items that had to be “built-in," like the kitchen cabinets and countertops, the 24 exterior windows, and the stair railing, did you have any problem getting them to fit? Or did you have to modify them in some way? Have you used sources other than the ReBuilding Center to obtain/purchase items? Yes—Habitat for Humanity in Portland, Cedar Hills and Forest Grove; Goodwill; and Craigslist. 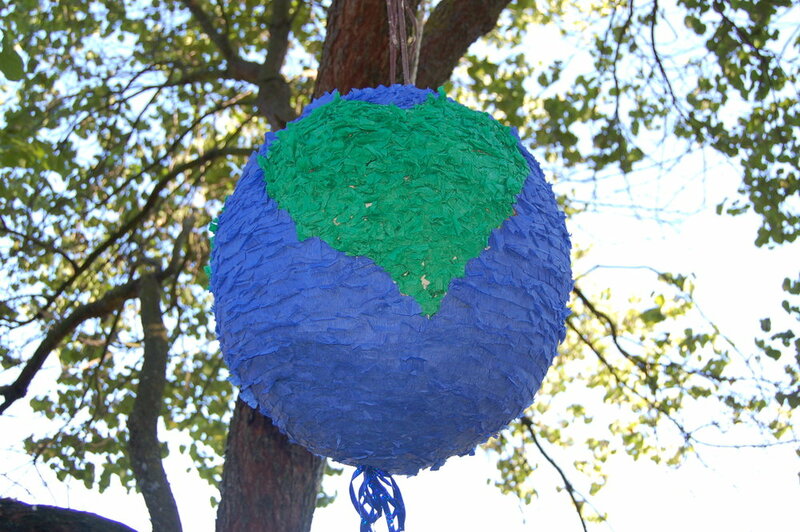 Do you have a philosophy that supports your use of recycled building materials? Considering a great deal of effort and expertise goes into manufacturing a walnut door or a leaded glass window, it’s a shame to send a craftperson’s work to a landfill. We find that often a recycled item is just as good as or better than new [materials] and is less expensive. Those savings are passed onto our family and employees, it puts a whole new spin on recycling! What other things have you purchased from the ReBuilding Center? Of all your purchases of recycled items, which do you like the most? We like the windows used on the front deck in place of iron balusters. It saved us a lot of money in place of using many balusters. And it gives the home a charming artistic flair without being over the top. Repair PDX was formed in March 2013 to bring repair events to Portland residents. Inspired by the Netherlands Repair Cafés, a group of dedicated volunteers have held Portland Repair Cafés about once a month since May 2013. The typical Repair Cafés are festive events where you can often get a bite to eat and a drink while meeting others from your community who are also interested in repair. Volunteer experts are on hand to fix items and to teach you how to fix your own items. Each repair café event is unique, based on the venue and the volunteers present. The types of items that can be repaired depend on the skills of available volunteers. That’s right, repairs are carried out by “volunteer fixers!” Note: you can become a volunteer fixer to work at other Repair Café events – just email repairpdx@gmail.com with your contact information and what you’d like to do. Join us for a Repair PDX event at the ReBuilding Center! Bring your garments for mending, bikes and small appliances for repair. PORTLAND, OR. (February 3, 2017) — Local start-up MudBone Grown, LLC (MBG) and its partner programs GroundUp Organics, Green A&T have launched a culturally/ethnically-specific urban food systems project at the Oregon Food Bank’s 33rd Ave. Farm. MudBone owners Shantae Johnson and Arthur Shavers are NE Portland natives that made the leap to small farm agriculture early last year. “This is a game changer,” says Shavers. “This assistance saves us more than $10,000 of start-up costs that usually keep many people interested in this kind of work, from being able to launch their dream of farming . With the help from ReBuilding Center’s Community Outreach manager Edward Hill, who happens to have a background in urban farming, Shantae and Arthur in less than 60 days, were able to finish writing a business plan, establish land agreements, and create a farm plan that supported a formal partnership with the Oregon Food Bank on nearly an acre of fully equipped land in NE Portland. Additionally, education contracts with Black Parents Initiative (BPI), purchasing agreement with KAIROS School and local Food Prescription programs, and watershed enhancement funding, MudBone Grown is leading an environmental and community economic stewardship coalition that is modeled on national programs like Growing Power in Milwaukee, WI and Detroit Black Farmers in Michigan. MudBone Grown, formed as a LLC, focusing on promoting inter-generational community-rooted farming methods that create “measurable and sustainable environmental, social, cultural, and economic improvements.” MudBone will also be providing STEM/STEAM-based education, workshops, and outreach through things like on-farm demonstrations, hands-on engagement with local schools, and adult jobs training services for both interested small farmers and the general public. Intern at the ReBuilding Center! Are you a Facebook maven? An Instagram junkie? Do you like taking photos and writing? Do you enjoy unearthing hidden stories then sharing them via social media? If you’ve answered “yes!” to all, then you might be an ideal candidate for the Media Content Creator internship. If you’re committed to social change and using cool content to make that happen, apply now. If you are interested in this internship, please email communications@rebuildingcenter.org and fill out an application online. At the ReBuilding Center, community is at the heart of our mission, and the Community Outreach internship is perfect for someone who wants to roll up their sleeves and dive into helping forge, develop and manage community resources. If you like to write, create plans and be around people and organizations that are in sync with the ReBuilding Center’s mission to use existing resources in new and inspiring ways, apply now. If you are interested in this internship, please fill out an application online. Do you believe in the power of numbers? Are you a self-described data geek? More importantly - do you believe that numbers can help tell the bigger social media story? If this rings your career path bell, then you might be our next Digital Media Marketing Analyst intern. Use your talents with stats to help the ReBuilding Center further their mission rooted in community, recycling and reuse. Apply now. If you’re pondering a career in law, criminal justice or social work, the Court Liaison internship is a golden opportunity to gain exposure to criminal and restorative justice efforts. 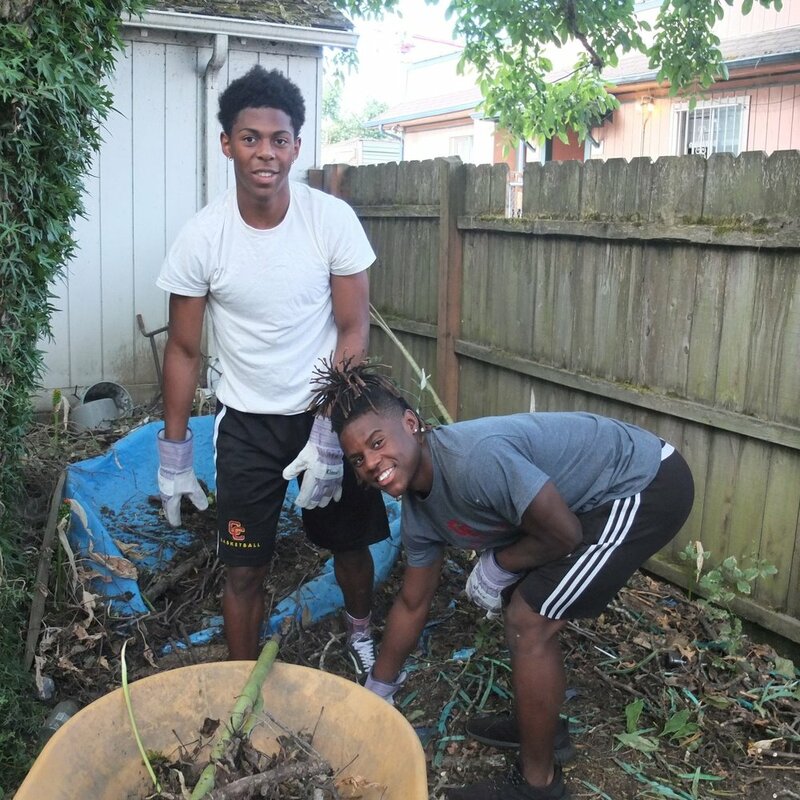 Learn how the ReBuilding Center works with organizations to further our community building mission by creating positive change via those fulfilling court-mandated volunteer work. This is meaningful, important and rewarding work — and if you want to connect with our justice system in a very real and hands-on way, apply now. If you are interested in this internship, please email dave@rebuildingcenter.org and fill out an application online. Get involved with the Portland reuse community this January with the Rebuilding Center! Learn more about reuse and remodeling with the Portland Build, Remodel, and Landscape Show; help build community with Hands On Greater Portland; gain fire safety skills with the Red Cross; add to your resume with Rebuilding Center internships; join the newsletter team; do some cathartic denailing while salvaging materials for reuse; and represent RBC's DIY spirit tabling at the Portland Fix-It-Fair. Check out these amazing opportunities below! Join us in honoring the legacy of Dr. King through meaningful service to our community. Volunteer for a shift at our table to share ReBuilding Center info with attendees. Before or after your shift, see the latest design trends and talk to experts about energy efficiency, home automation, windows, and much more. Volunteers that table at the Build, Remodel, and Landscape Show will actively engage those attending the show as a representative of the ReBuilding Center. Event volunteers will answer questions, provide information, and be a general steward for our organization's mission of "Inspiring people to value and discover existing resources to strengthen the social and environmental vitality of communities." New to volunteering at the ReBuilding Center? Email volunteer@rebuildingcenter.org with any questions. Are you interested in making new friends in the community while volunteering? Look no further than a Hands On event at the Rebuilding Center. ReBuilding Center and Red Cross are teaming up to keep people safe in 2017! Documenter: The documenter should have good handwriting and attention to detail for completing paperwork. The documenter will document the services provided, detailing the number that were in the home before the team perform their installation, the number of Red Cross alarms installed, if a plan was developed, and basic demographics information about the residents in each household. The documenter in addition to completing paperwork will also maintain an accurate count of total alarms installed, homes visited, and other details. Educator: The educator will share fire prevention and response information with the residents. They will encourage/assist the residents with creating a home-fire evacuation plan. The educator will also provide residents with information about actions they should take when an earthquake occurs and information about what should be included in their disaster supplies kit. Installer (minimum 16 yrs/old): The installer will inspect existing alarms to verify that they are working, their age, and their placement. The installer will offer to replace alarms that are 5-years or older with new alarms. They will also install additional alarms and place them based on recommendations provided by the Oregon State Fire Marshal. Every Tuesday and Saturday, come on out to help us divert materials from the waste stream! 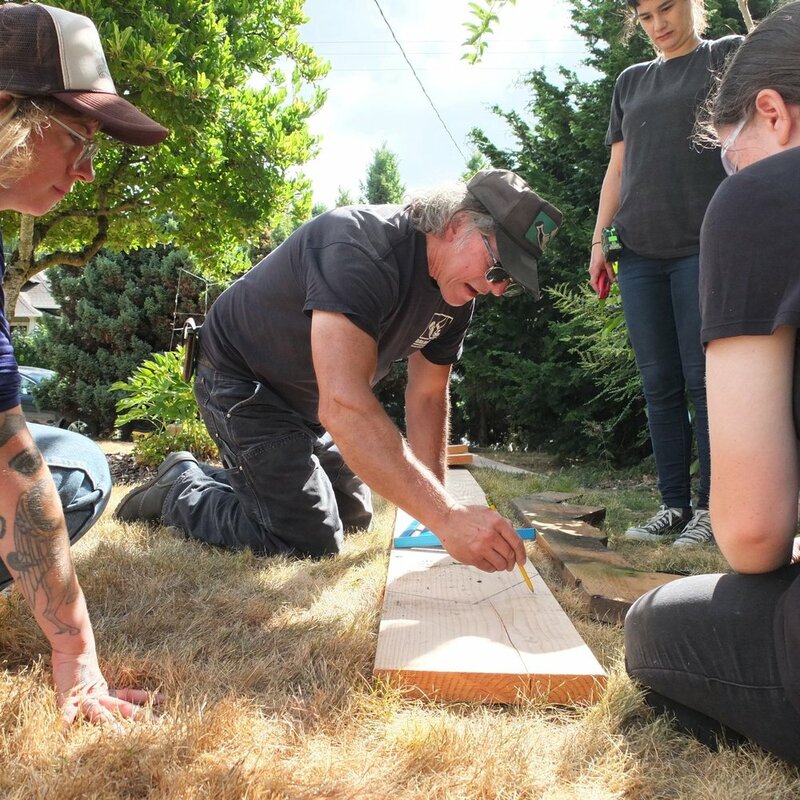 You'll team up with Pete Heim, our Site Supervisor to rid salvaged boards of it's nail-esque componentry and turn them into salvaged building materials for reuse (that could end up being used in a volunteer-led project to build tiny houses for the houseless)! 9:00 am. - 1:00 p.m. Event volunteers will answer questions, provide information, and be a general steward for our organization's mission of "Inspiring people to value and discover existing resources to strengthen the social and environmental vitality of communities." Every week, the newsletter team meets with Ashley, the ReBuilding Center’s Communications & Marketing Manager. Together, the team writes stories, carries out interviews, takes photos, and puts together the ReBuilding Center’s e-newsletters. These newsletters are great portfolio/resume builders! The newsletter team is comprised of volunteers just like you! This is your newsletter, written by volunteers, for the ReBuilding Center community. Then click on "My Schedule," select any Thursday, click "Schedule me," select any time between 10:00 a.m. and 5:00 p.m., hit "Continue", confirm, and voila! Alternatively, you can email Ashley Howe, the Communications & Marketing Manager at ashley@rebuildingcenter.org. 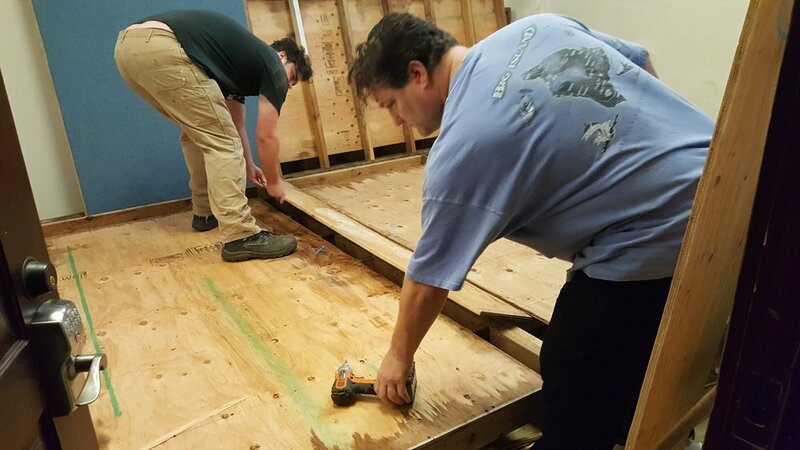 Get involved with the Portland reuse community this winter with the Rebuilding Center! 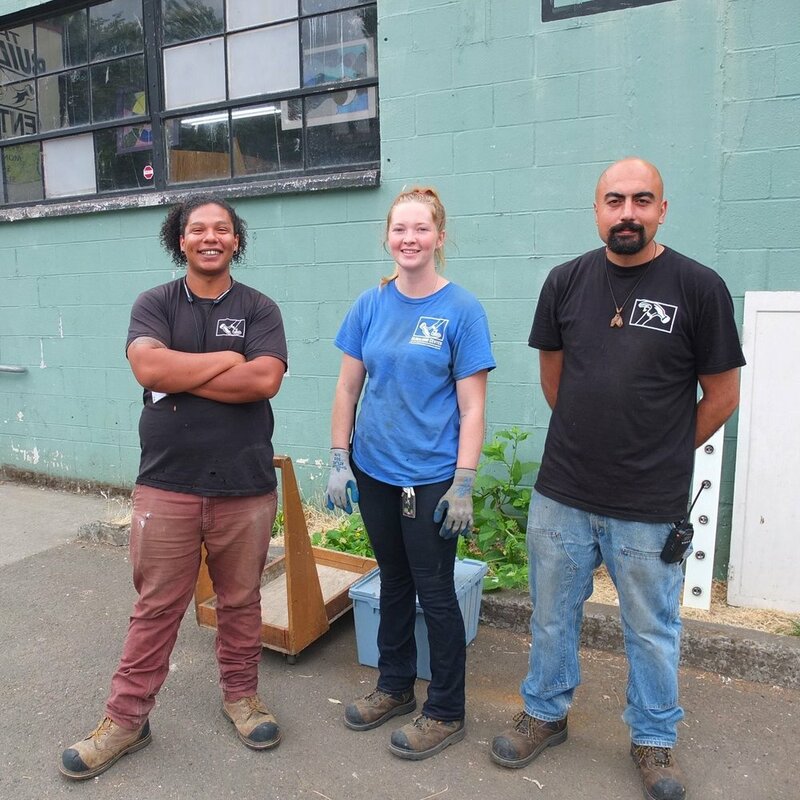 Help build community with Hands On Greater Portland; add to your resume with Rebuilding Center internships; join the newsletter team; and learn more about reuse and remodeling with the Portland Build, Remodel, and Landscape Show. Check out these amazing opportunities below! Are you interested in making new friends in the community while volunteering? Look no further than Hands On at the Rebuilding Center. Come to the Rebuilding Center to help with hands-on projects while working with donated materials. Afterwards, head across the street with fellow participants to StormBreaker Brewing for a post-volunteering happy hour! For more information, contact Dave Lowe at dave@rebuildingcenter.org . Do you have an interest nonprofit work, data analysis, media creation, or social media? Do you want to gain experience using data analysis and marketing tools to boost nonprofit efforts while increasing your business, technical, and marketing skills? If so, apply for the Digital Marketing Analysis internship or the Media Content Creator internship with the Rebuilding Center! For more information, email Ashley Howe at ashley@rebuildingcenter.org. To sign up schedule yourself through ReBuilding Center's online Volgistics portal by entering in your login information here, click on "My Schedule," select any Thursday, click "Schedule me," select any time between 10:00 a.m. and 5:00 p.m., hit "Continue", and confirm! Alternatively, you can email Ashley Howe, the Communications & Marketing Manager at ashley@rebuildingcenter.org. Need some home modeling inspiration? Join the ReBuilding Center at the Portland Build, Remodel, and Landscape Show from January 6-8, 2017, at the Oregon Convention Center. Volunteer for a shift at our table to share ReBuilding Center info with attendees. Before or after your shift, see the latest design trends and talk to experts about energy efficiency, home automation, windows, and much more. Volunteers that table at the Build, Remodel, and Landscape Show will actively engage those attending the show as a representative of the ReBuilding Center. Event volunteers will answer questions, provide information, and be a general steward for our organization's mission of "Inspiring people to value and discover existing resources to strengthen the social and environmental vitality of communities." Volunteers can sign up through Volgistics or contact Volunteer Services at volunteer@rebuildingcenter.org to get registered. 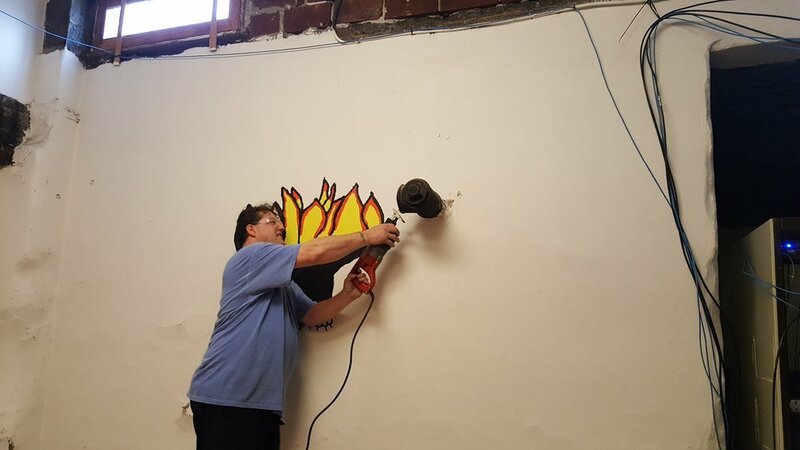 The old studio wall was festooned with a drawing of a flaming cat by famed Portland author, Chuck Palahniuk. The team is trying to figure out a way to work a into their new design. When RBC’s Volunteer Services Manager, Dave Lowe, had a chat with XRAY.FM’s team about volunteerism, a collaborative project idea sprouted. “It’s essentially a recording studio for podcasters and bands. It has the added function of being a live room that we can broadcast from,” says Rizzotto. Listen for broadcasts from the new studio in the near future at 91.1 FM and 107.1 FM in Portland, and online at XRAY.FM!